Chris Skinker in liner notes to Jimmy Martin and the Sunny Mountain Boys, Bear Family Records, 1994. J.D. Crowe had a musical conversion experience at the age of twelve, on September 17, 1949, when he first heard Lester Flatt, Earl Scruggs & the Foggy Mountain Boys play at WVLK’s Kentucky Mountain Barn Dance in Lexington, Kentucky. There are photos showing the youngster sitting in the aisle, his eyes intently fixed on Scruggs’ banjo. Purchasing the Foggy Mountain Boys’ 78-rpm records, he would slow them down in order to decode the complex patterns of bluegrass banjo classics. The next year, Crowe won a radio appearance with Esco Hankins in a talent competition, which led to other stage and radio work in the local area. Jimmy Martin, driving through Lexington, heard the young banjo player on the radio. Martin convinced J.D.’s parents to let him come to Middletown, Ohio, and play with his group on radio station WPFB. Crowe credits his emerging style – hard and constantly driving – as the way Jimmy Martin wanted to hear the banjo played. But there are blues licks in J.D.’s music that derive from a different source – his teen-aged interest in blues and rock ‘n roll guitar. Having promised his parents he would, Crowe left the band in the fall of 1954 to return to school. Shortly thereafter, Martin obtained an RCA recording contract and moved to Detroit, teaming with Bob and Sonny Osborne. The Osbornes and Martin split in 1955 and Martin stayed in Detroit, where Sam “Porky” Hutchins and Earl Taylor joined the band. J.D. Crowe played the summer of 1955 with Mac Wiseman and returned to school again that fall. When Sam Hutchins returned to Baltimore in 1956, Crowe joined Martin full time in Detroit. 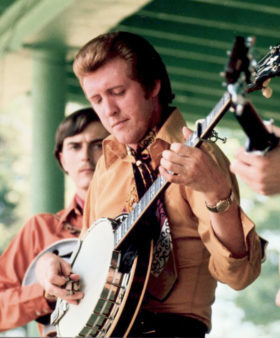 Although he enjoyed his time with Martin, during which he recalls playing banjo in the touring car for 400 miles without stopping, Crowe left the band in 1961 to return to Lexington and work a “day job,” behind a counter at Wilson Equipment, a distributor and rental center for heavy equipment. It has never been easy for even the top musicians to make a living in bluegrass. In Kentucky, J.D. teamed with other local part-time musicians to work weekends in several local taverns. They took the name “The Kentucky Mountain Boys,” and soon included Doyle Lawson on guitar and mandolin, and Bobby Slone on bass and fiddle. During this time, Jimmy Martin called J.D. back to play on two Decca sessions in September, 1963, and November, 1966. In 1968 J.D. was asked to take his band to the Red Slipper Lounge at Lexington’s Holiday Inn North for five-night-a-week performances. This was one of the first times a bluegrass group had played in an upscale environment, to primarily college-educated audiences. Crowds lined up in the parking lot to wait for vacant seats. With Doyle Lawson and Bobby Slone still in the band, Crowe recruited Red Allen to play guitar and sing lead vocals. This group of seasoned, full-time bluegrass professionals recorded the album “Bluegrass Holiday” on the Lemco label (later reissued on Rebel) before Red left the band in 1969. Doyle Lawson briefly rejoined Jimmy Martin then came back with J.D., this time on guitar after Larry Rice moved from California to play mandolin and sing lead. Two albums from this configuration were released on Lemco and reissued on Rebel. 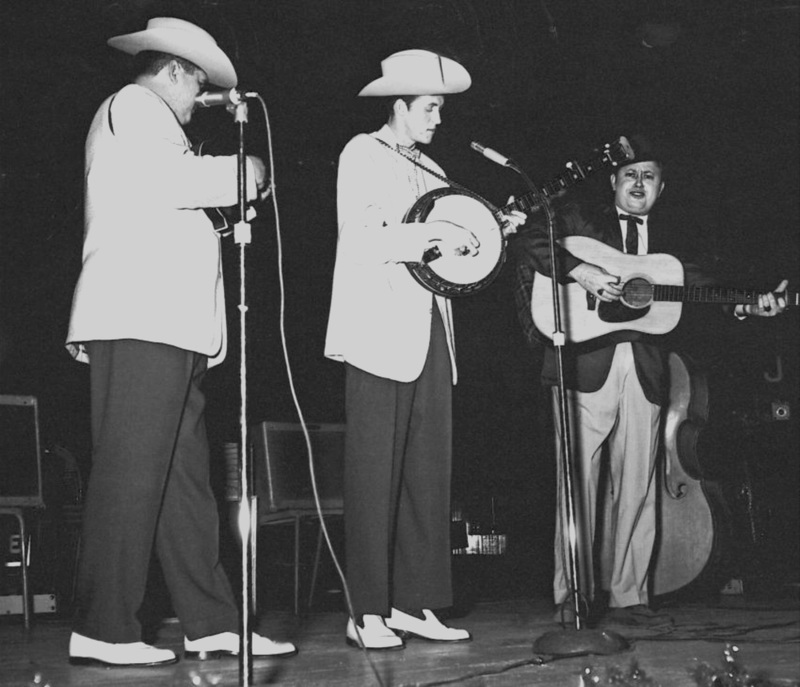 The Kentucky Mountain Boys became a headline act on the early summer bluegrass festivals, while maintaining nightly appearances at several different clubs in Lexington, Louisville, and southern Indiana. One of the most brilliant ensembles in the history of bluegrass music came together in late 1974, after Larry Rice left to tour with a Dickey Betts-led spinoff of the Allman Brothers. Ricky Skaggs moved over from the Country Gentlemen, adding a strong tenor voice to the trio, and the band quickly “unplugged.” Now appearing five nights a week at the Lexington Sheraton Inn, the group perfected an acoustic sound and vocal trio renowned for its technical perfection, sparkle and originality. Jerry Douglas guested on Dobro for the legendary Rounder debut album “J.D. Crowe & the New South” (widely known as simply “0044”) in January, 1975, then joined the band for that summer’s festival season and an August tour of Japan. At the end of that tour, Tony Rice went to California to join the first iteration of the David Grisman Quartet. Skaggs and Douglas left to found Boone Creek, the first bluegrass supergroup composed entirely of young players. J.D. continued to explore new musical ground with a succession of talented musicians. These included Jimmy Gaudreau, Harley Allen, Glenn Lawson, Gene Johnson, Steve Bryant, Paul Adkins, Wendy Miller, and Tony King (Bobby Slone was a constant, staying with the band through the mid-‘80s). 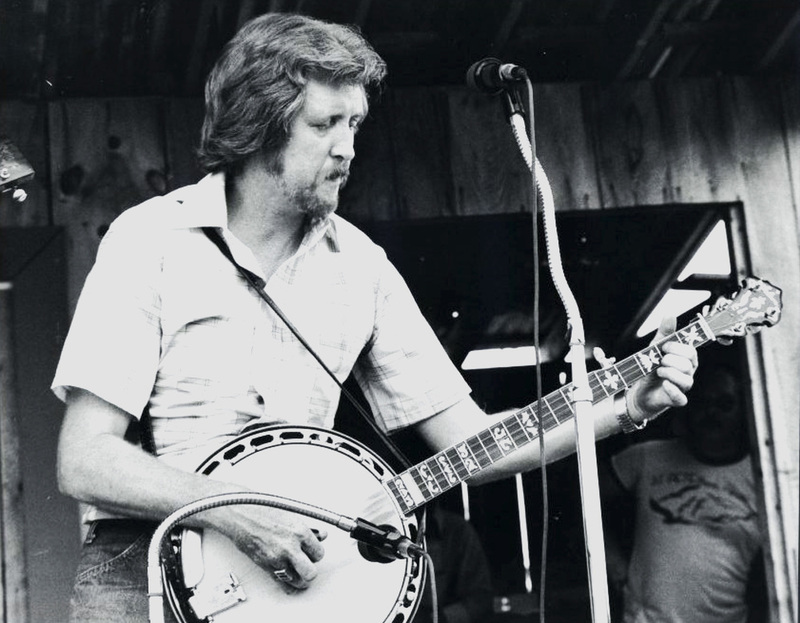 When Keith Whitley left Ralph Stanley & the Clinch Mountain Boys in 1978, he shared with J.D. his lifelong dream to perform country music. With Crowe’s encouragement, Whitley prepared for his subsequent solo career as a featured vocalist on the New South’s Rounder albums “My Home Ain’t in the Hall of Fame” (1979) and “Somewhere Between” (1982). Both included steel, electric bass, and drums, along with Crowe’s banjo. Beginning in 1981, J.D. Crowe balanced the progressive sounds of his own band with those of a recording (and occasionally performing) traditional bluegrass supergroup. The Bluegrass Album Band was conceived as a vehicle for introducing to new generations the classic repertoire, mostly out of print in the early CD era. Six best-selling albums were released (the last in 1990) featuring Crowe, Tony Rice, Doyle Lawson, Jerry Douglas, Bobby Hicks, Vassar Clements, Todd Phillips, and Mark Schatz. After a hiatus from touring with the New South, J.D. was back in 1993 with yet another generation of New South members: Richard Bennett, Don Rigsby, Curt Chapman, and Phil Leadbetter. That group’s “Flashback” on Rounder (1994) positioned the group firmly in the bluegrass mainstream. “Come On Down to My World” (1999) introduced Dwight McCall, Greg Luck, and Rickey Wasson to the band. “Lefty’s Old Guitar,” adding Ron Stewart and Harold Nixon, tied for Album of the Year in 2007. 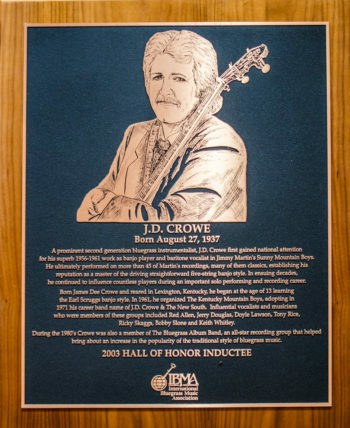 In his seventh decade as a professional musician, Crowe remains at the top of his game, a living legend. Based for most of his more than half-century career in the city of his birth: Lexington, Kentucky. Initially aspired to be an electric guitarist, with Ernest Tubb’s Texas Troubadours. J.D.’s baritone voice blends so well with other singers that it adds strong notes without standing out. While starring with Jimmy Martin on the Louisiana Hayride, J.D. worked in a gas station to supplement his income. Crowe’s rare vocal solos, never recorded, included occasional Little Richard covers on Sunny Mountain Boys concerts in the late 1950s. One of the first disciples of Earl Scruggs to make a lasting impression on bluegrass banjo playing. A member of the classic edition of Jimmy Martin’s Sunny Mountain Boys while still a teenager, J.D. Crowe was held up by Martin as the model for all his subsequent banjoists. An exemplary bandleader who fostered the talents of many successful artists, including Doyle Lawson, Tony Rice, Ricky Skaggs, Jerry Douglas, and Keith Whitley. Helped to revitalize the bluegrass genre with songs and styles adapted from rock, rhythm and blues, country, and folk music sources. Banjo player of the year in 1971, 1994, and 2004. Grammy winner for “Fireball” (1983), Country Instrumental of the Year. J.D Crowe at the Berkshire Mountains Festival in Ancramdale, New York late 1970's. Photo by Ron Petronko. From the Archives: Paul Williams, J.D. Crowe and Jimmy Martin in 1958 at the WWVA Package Show in Ottawa Auditorium at Lansdowne Park in Ottawa Ontario, Canada. Photo by Ron Petronko. From the Archives: Country and Western Magazine out of Japan. Volume 71 Oct., 1975 Featuring: J. D. Crowe and The New South. Donated by Mr. Masaaki Yoshimura. Fred Bartenstein, from “A New Wind Blowing: J.D. 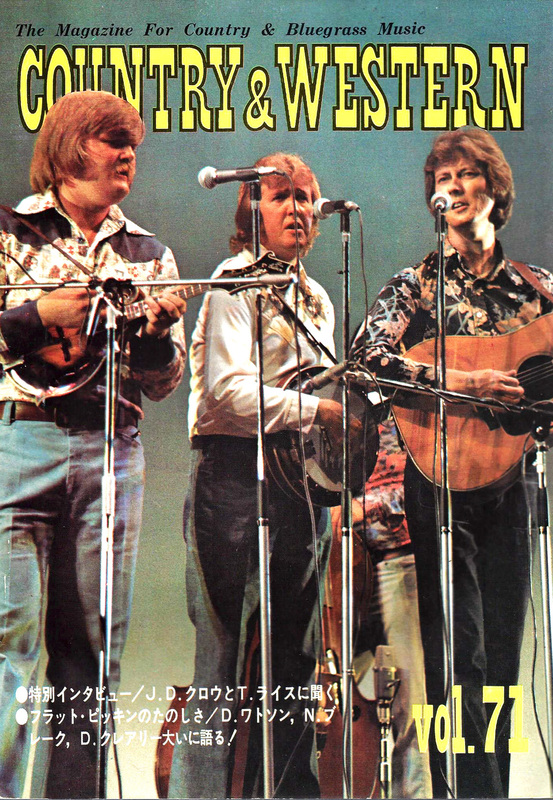 Crowe and the Kentucky Mountain Boys,” Muleskinner News, November-December, 1970. Quoted in “J.D. Crowe and the New South: An Interview by Fred Bartenstein,” Muleskinner News, July, 1975. Leon Smith in “Talking With the Stars: Two Interviews from a ‘Bluegrass Hornbook,’” Bluegrass Unlimited, July, 1981.